The rise in demand for more and more bandwidth coupled with resource constraints are common challenges in today’s Higher Education networks. 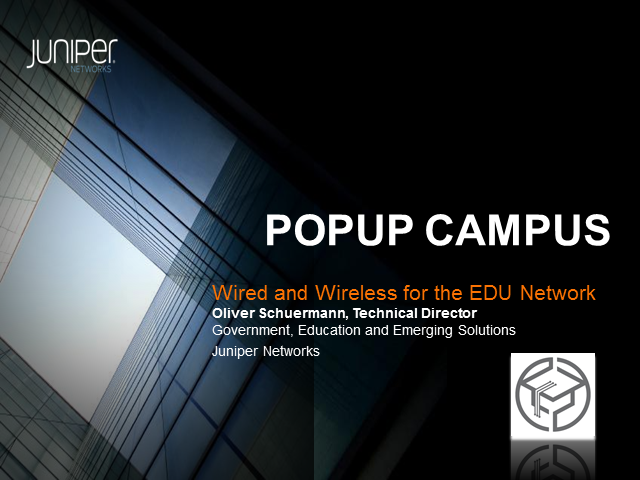 Join Juniper Networks to discuss the Automated Workflow nicknamed “Popup Campus” and learn how to use Junos Automation to minimize redundancies and manual processes, while freeing up design level resources to do more innovative tasks that take your technology to the next level. Forty-four states, DC and four territories have adopted the Common Core State Standards (CCSS). This means that school districts across the country are planning for 100% online assessments during the 2014-2015 school year. One of the most important conditions needed for being able to administer online assessments is network infrastructure readiness. Your business never stops. Neither should your network. Learn how an always-on, always-available enterprise provides users with complete access to business-critical applications such as unified communications and collaboration (UC&C) anytime, anywhere, from any device. In fact, UC&C is a key driver of business transformation. As your organization grows, evolves and competes, seamless global communications are a must. In this session, industry experts will reveal what is driving network change and share what’s needed to enable a quality UC&C experience. Learn how Juniper Networks ON Enterprise solutions can keep your business connected and reduce operational complexity while achieving the best ROI for your UC&C investments. Spend 30 minutes with Andy Ingram, Data Center Vice President at Juniper Networks, as he answers some of the most common questions about Juniper’s new MetaFabric Architecture and what it takes to build a new, more efficient data center. This session includes an interactive Q&A session if you have questions you would like to ask. Unified Communications and Collaborations (UCC) tools are revolutionizing the Enterprise. These tools enable greater connectivity among employees, customers and partners, while increasing efficiency and productivity and lowering costs. As a leading provider of unified communications Microsoft’s David Grider, Lync Technology Specialist, will share some of the trends he sees in UCC, discuss why enterprises are moving to unified communications technologies and the benefits for deploying these game-changing enterprise tools. Additionally, as organizations plan for UCC as a means for increasing productivity and collaboration there are numerous networking requirements to consider as well. Gary Clark, IT CTO and VP of Technology Services at Juniper Networks will share details of Juniper’s recent worldwide deployment of Microsoft Lync. He will discuss considerations for deploying cloud-based collaboration tools across a global enterprise—and how a well-designed wired and wireless infrastructure provides the critical foundation that ensures an exceptional user experience. Today’s Health IT leaders face a difficult task in handling mobile device security and policy compliance, particularly given the mobile transformation happening in healthcare today. Driven in part by the adoption of new care models like remote patient monitoring and telemedicine, and the Bring Your Own Device, or BYOD trend, the consumerization of IT is driving end-user demand for ubiquitous access – to networks, to clouds, to applications, to everything – from any device, anywhere at any time. In this webinar, we will highlight the challenges of mobile device security, management and policy today. We will consider the issues faced by Health IT teams when managing different operating systems across a myriad of devices, some of which are user-owned. Finally we’ll look at how Juniper Networks solutions address a broad spectrum of security and end-user experience issues, as we walk through a day in the life of a mobile clinician. Register now to attend! Technology has become a major game changer in the higher education space; from general connectivity to the overall digital learning experience. This is giving some universities the edge, and leaving some behind. Join Juniper Networks for a discussion on Technology Trends in Higher Education to learn how Juniper can help you find your edge. Healthcare organizations today recognize that IT plays a critical role in enabling better overall patient care. The recent focus on key application investments to meet meaningful use mandates (EMR, PACs, CPOE, etc) is putting added pressure on hospital networks. Legacy networks and quick band-aid fixes are incapable of satisfying new demands from users and data centers. Join Juniper Networks and special guest, Griff Law, Chief Technology Officer from Northeast Georgia Health System for a discussion on why a successful network refresh can be a quick win for healthcare IT organizations and lay the groundwork for better business, clinical, and IT alignment. We’ll hear firsthand how their previous infrastructure design and their current strategy for a simplified network translated to a more easily managed architecture and enhanced performance to help better support clinical decisions. We have moved beyond how Wireless networks were originally designed. Today, IT teams are challenged with how to handle today's rich media demands or exponentially increasing traffic. Even now, WLANs are now faced with mission critical demands and user expectations to access resources anytime, anywhere, with no delays. Meaningful Use incentive programs. New HIPAA regulatory measures. Medical data explosion. Mobile health demands. Numerous factors are driving healthcare organizations to control who’s allowed to access the healthcare network and what resources –applications, data, patient records - they’re entitled to view or edit. But consider this: A doctor, who inadvertently picked up malicious code during a telemedicine event, can infect your entire network. A disgruntled employee can exfiltrate patient records. And cyber criminals are always looking for ways to steal and sell your valuable data. Is your network designed to identify the suspicious traffic and/or anomalous behavior to a specific user or device? Can your organization afford the painful penalties under the final HIPAA/HITECH omnibus rule due to a security breach? What happens next depends on the policies and controls you have in place to restrict and protect your assets and data from the vulnerabilities that openness and user mobility bring. Not to mention, the controls you need simply to comply with industry and government regulations. Take some time to join us for this free webinar. You’ll hear from Steve Spearman, HIPAA regulation specialist who will guide you through the in’s and out’s of the newly-announced Health Insurance Portability and Accountability Act. We’ll also provide an overview of Juniper’s network security portfolio, designed to help ensure secure, consistent access to data while reducing your risk associated with HIPAA and Meaningful Use mandates.